All chemical reactions basically always raise questions of selectivity. Whether, how and how quickly particles react with each other depends on a large number of factors that can always be evaluated energetically in interaction with structural considerations. In many cases, two or more alternative products will result from the same reactants. 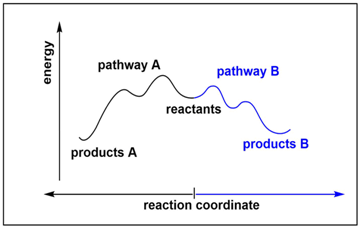 Answering the question regarding which portions of these products are formed is only possible by a detailed energetic consideration of the reaction paths (Figure 1). In all cases, from a didactical point of view, these are competing or comparable reactions. 1 Chemoselectivity is the most important of the various selectivities. 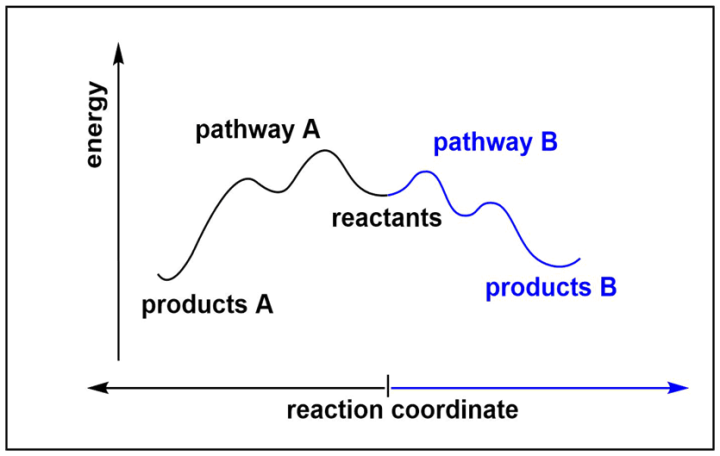 This means that reactants may form a specific product through a particular mechanism and, through another mechanism, an alternative, typically non-constitutive isomeric product. 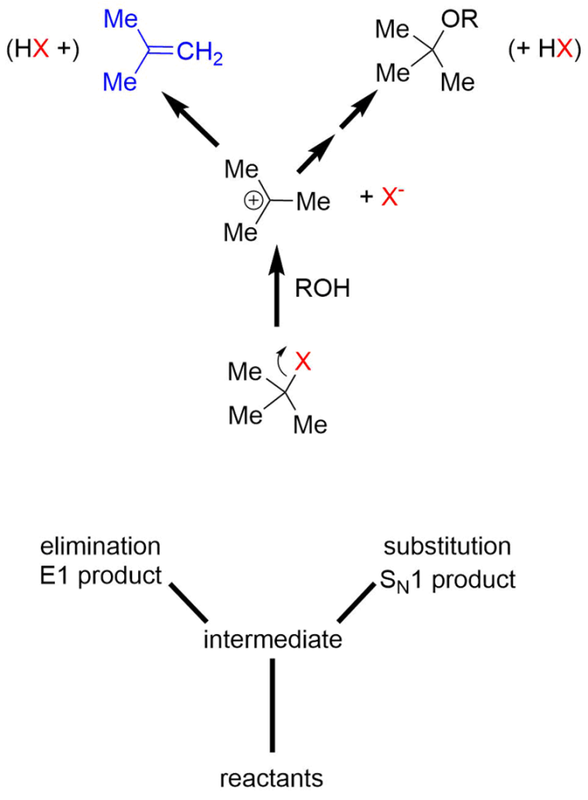 A prominent example of such a competition is – especially from a didactical perspective – between an SN1 and E1 reaction. As with almost no other example, students are challenged to reflect on the diverse structural and energetic implications of chemical reactions using organic chemistry concepts, or, more generally speaking, to think in mechanistic alternatives. SN1 and E1 reactions typically are the first reaction mechanisms discussed in organic chemistry courses, as they cover some of the most important concepts which are “discovered” in our lab experiments. Both are two-step reactions; the first step, the formation of a carbocation, is identical and rate-determining in both cases. This was demonstrated by the solvolysis of reactants with a tert-butyl skeleton but different leaving groups. 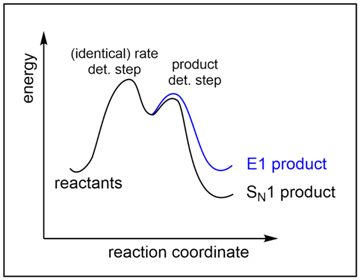 2 Although substrate A reacts much faster than substrate B, from the intermediate on, the tert-butyl cation, the course of the reaction is identical in both cases. Both reactions provide (at 65°C) elimination and substitution products in nearly the same yields (Figure 2). While the first step is rate-determining, the second is product-determining, as the product ratio of elimination and substitution product is decided in it. The energy scheme of an SN1 reaction competing with an E1 reaction (e.g. that of substrate A in the example above) is that shown in Figure 3. Ideal starting materials of such competition reactions are reactants which can form comparatively stable carbocations, such as the tertiary substrates described above or even benzylic substrates, provided they can release good leaving groups, such as bromide, iodide or tosylate (as weak bases). Competing SN1/E1 reactions occur typically under solvolysis conditions: Protic-polar, weakly nucleophilic solvents like alcohols promote the dissociation of the respective substrate into carbocation and leaving group by the particles being stabilized either by Lewis base/Lewis acid interaction of solvent and carbocation (ΔH<0) or by hydrogen bonding of leaving group and solvent (ΔH<0). These exothermic partial processes are important, because energy must be supplied (ΔH>0) for the heterolytic cleavage of the CX bond and the effort can be partially compensated through the formation of hydrogen bonds and by binding interactions between the sextet center and lone pairs of the O atom (Figure 4). In addition, the dissociation reaction benefits energetically from steric relaxation, especially when tert. carbocations form with large groups and large leaving groups (e.g. iodide or even tosylate) are split off. The reason for this is that the bond angles between the substituents are widened from the tetrahedral angle (~109°) to 120° (trigonal-planar arrangement). The change in the reaction entropy, which is not easy to describe, is not considered in this detailed energetic consideration and, thus, becomes the crucial factor in the second step of the reactions. The change in entropy would have to be properly described by a number of factors. Last but not least, for example, the role of solvent effects should be considered more closely. From the perspective of students, however, the most important and most concrete quantity is the change in the number of particles during the reactions. While the total number of particles does not change during substitution, it increases in the case of alternative elimination. However, as the number of particles increases, the entropy S of a reaction increases as well. The value of the change of the entropy, ΔS, receives a positive algebraic sign. The application of the Gibbs-Helmholtz equation (Figure 5) reveals that the higher the absolute reaction temperature, the higher the “entropy term” as product of absolute temperature and entropy change (TΔS) over the enthalpy term (ΔH) is. In other words, E1 elimination reactions benefit more from increasing the reaction temperature than SN1 substitution reactions. 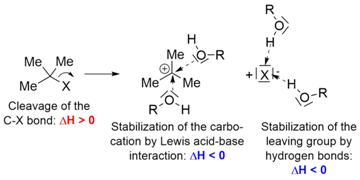 At the same time, as the temperature increases, elimination reactions are favored over their formal back reactions, the electrophilic addition reactions. 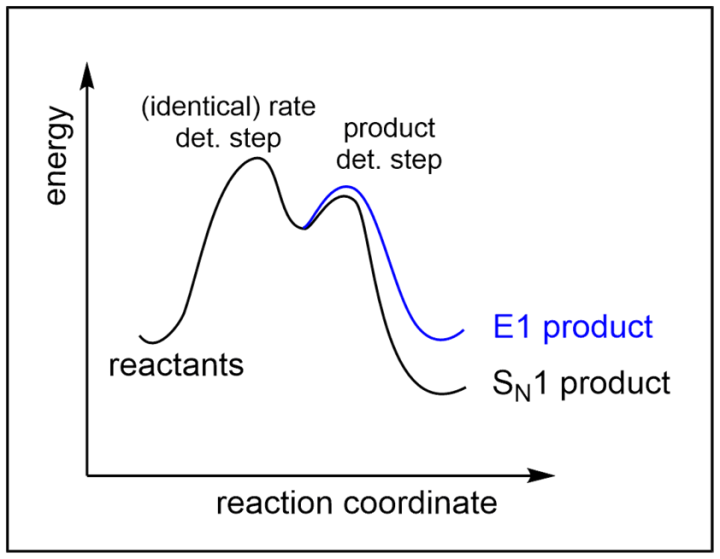 The elementarization of the mechanistic E1/SN1 competition is extremely interesting in chemistry education, because both mechanisms are indistinguishable in the first step and separate their pathways only after reaching the reactive intermediate. This is a kind of mechanistic Y-model (Figure 6). In this example, learners can grasp particularly well that basically there are always energetic alternatives in chemical reactions as quantum mechanical processes. Moreover, recent studies have shown that learners tend to expect exactly the “right result” of an organic-chemical reaction or the “right concept” to use for problem solving, in accordance with the solution of a mathematical problem. 3 This expectation is rarely fulfilled in the reality of chemical reactions. According to the laws of thermodynamics, under very specific reaction conditions, a certain portion of the particles follows reaction path A, while another portion follows reaction path B. The experimental elaboration of the mechanistic alternative SN1/E1 described below for learners in the high-school teacher training should ideally follow the SN1 mechanism, which had also been developed previously by means of suitable experiments. 6, 7, 8 On the one hand, learners can get to know the E1 mechanism and, on the other hand, they can experience thinking in mechanistic alternatives as a typical way of thinking about organic chemistry. Building on our experimental work on the SN1 reaction, 7 the series of new experimental setups on SN1/E1 competition reactions presented here implies that the protic-polar solvent, which is also the nucleophile in SN1 reactions, is varied, which makes it sterically demanding and, therefore, a relatively good nucleophile. Specifically, the use of isopropanol, compared to ethanol, results in less substitution and more elimination. 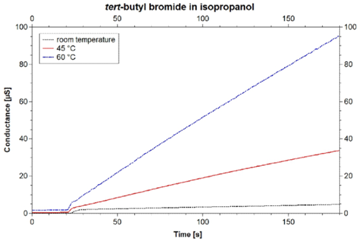 In addition, isopropanol is more favorable than tert-butanol, since no substitution is observable in the latter. 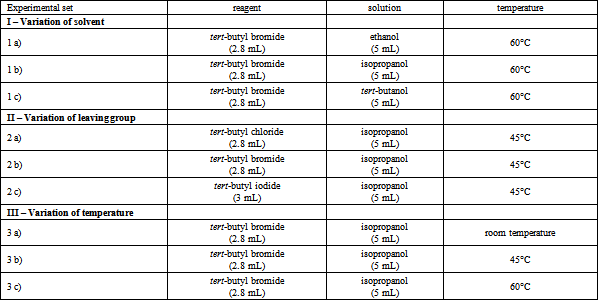 From the variations shown in Table 1, the reaction of tert-butyl bromide with isopropanol at 60°C has been found to be the reaction in which the competition of substitution and elimination occurs side by side. The choice of a substrate with a tert-butyl skeleton also means that the elimination product isobutene formed by the E1 reaction is a gas at room temperature. As such, it can be easily removed from the reaction mixtures and introduced into a solution of bromine in water. Since the bromine concentration is defined, the time until decolorization of the solution (by electrophilic addition of bromine) is a measure of the relative content of butene as a product of the E1 reaction. This first experimental setup is particularly suitable for introducing the E1 mechanism as a new competitor to the SN1 mechanism, based on preliminary work on SN1 reactions. In accordance with the experiments described in Figure 2, we varied the leaving group of the substrate in the next experimental setup: Chloride vs. bromide vs. iodide. However, all other reaction parameters were kept constant (isopropanol as solvent/nucleophile, tertiary substrate, reaction temperature 60°C). 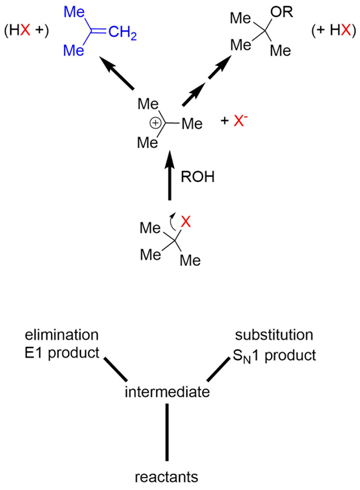 The primary result of this experimental setup is that all substrates lead to elimination products next to substitution products, regardless of the leaving group. Secondly, comparative measurements of the electrical conductance of the reaction solutions (caused by resulting ions) show qualitatively that the reactions proceed at different rates, an observation that is based on the learners’ knowledge of the SN1 reaction. However, it can only be demonstrated by GC-MS studies that, in accordance with Figure 3, no significant difference in the ratio of substitution and elimination product occurs at the same reaction temperature. The result of these experiments is that students work out that the formation of the carbocation is the rate-determining step in the E1 mechanism, as it is known to the learner in the SN1 mechanism. If this was not the case, then the variation of the leaving group would have no effect on the rate of the product formation. Regarding the three substrates, the one with the bromide leaving group has been found to be the best for experimental set 3 purposes. Tert-butyl iodide leads, in part, to complicating side reactions and cannot be stored for long, which makes it less suitable. The last of the three setups (reactants: tert-butyl bromide, isopropanol) in our series is the one with the greatest educational importance but, at the same time, the highest complexity for learners. In this setup, while maintaining the reactants, only the temperature is varied (room temperature vs. 45°C vs. 60°C). It shows that, unlike the variation of the leaving group, the proportion of the elimination product at the expense of the substitution product increases with increasing temperature. An indication of this is provided by the much faster decolorization of the bromine solution. However, this fact can only be proven ultimately by comparative GC-MS measurements, which we also carried out. Observing the much faster decolorization of the bromine solution, which must be supplemented by the result to be derived from GC-MS studies, the rate of both substitution and elimination product rises at a higher temperature in both cases. However, a higher proportion of elimination product raises the question of the energetic cause for this change in the product rate. We recommend initially discussing the change of the reaction enthalpy in order to approach a solution to this question with students. Schematically, this is possible by calculating the bonding enthalpies of broken and formed bonds (using standardized values and without considering the solvent effects). Learners can deduce from this schematic calculation that the substitution (SN1) should be exothermic overall, whereas the elimination (E1) should be endothermic. The weak carbon-bromine bond is equally broken in the first step in both reactions. In the case of substitution, however, a strong carbon-oxygen-σ-bond is subsequently formed, whereas in the case of elimination, only a comparatively weak carbon-carbon-π-bond is formed. This intermediate result of a change in the reaction enthalpy (ΔH>0) raises the question of an energetic explanatory model for the fact that reactions at higher temperatures apparently follow a path which is unfavorable in terms of reaction enthalpy. This moment seems to be best suited to introduce students to or apply the Gibbs-Helmholtz equation, which summarizes that two energetic quantities always have to be considered for the energetic evaluation of chemical reactions: Not only does that change the enthalpy in every chemical reaction (heat Χ), but also the reaction entropy (ΔS). The influence of this quantity, which can be defined as the endeavor for equal energetic distribution in chemical systems, depends mainly on the temperature: The higher the absolute temperature, the more important the so-called “entropy term” TΔS becomes. The margin between the change in the reaction enthalpy (ΔH) and the product TΔS finally results in the so-called Gibbs free energy ΔG. Only this figure allows the assessment of whether a chemical reaction can proceed from a thermodynamic point of view. Finally, concerning chemistry education, it is particularly important to point out that elimination reactions, such as the E1 reaction of tert-butyl bromide to isobutene and hydrogen bromide presented here, are the formal revision reaction of the electrophilic addition of hydrogen bromide to alkenes. It depends ultimately only on the temperature if the reaction runs from left to right or from right to left. With this fundamental insight, the experiments presented are also connectable to contexts of great industrial importance. The petrochemical cracking of hydrocarbons, for example, is based on the fact that the entropy increases significantly with the cleavage of long-chain to short-chain alkenes and these processes can be promoted by increasing the temperature. 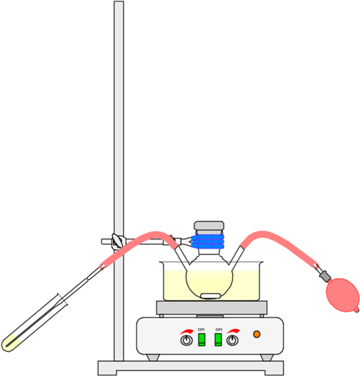 We modified the experimental setup to proof the formation of a gas containing a double bond and added a rubber pump (Figure 8). A pipette is used for this purpose to lead the gas directly into a test tube with a solution of bromine water. If the formation of an acidic gas is detected, the same setup can be used and a strip of wet indicator paper can be placed under the pipette instead of pumping the gas into the bromine solution. All the chemicals were selected carefully. We chose chemicals that are nontoxic, easy to handle and inexpensive. Furthermore, all chemicals must meet certain criteria in terms of conductance. All chemicals were ordered from Sigma-Aldrich. All the chemicals we chose have a low intrinsic conductance, so that all increases in conductance observed are significant and easily detectable. They are checked at the beginning of every experiment to prove the low intrinsic conductance. The temperatures chosen in each experimental set depend on the lowest overall boiling point of the chemicals used. We used gas chromatography with mass spectrometric detection to verify our experiments. All chemicals must be handled with care. All experiments must be conducted under a fume hood with students wearing safety glasses, gloves and a lab coat at all times for safety reasons. All chemicals used are highly flammable and should be kept away from fire. In addition, isopropanol causes serious eye irritation and may cause drowsiness or dizziness. Breathing vapors must be avoided. Ethanol causes serious eye irritation. Tert-butyl iodide causes skin and serious eye irritation and may cause respiratory irritation. Therefore, contact with eyes and skin should be avoided. Tert-butanol is harmful if inhaled, causes serious eye irritation and may cause respiratory irritation. Inhaling vapors and contact with eyes must be avoided. Bromine is used as a bromine-water solution (1 %) which reduces the toxicity. Nevertheless, the bromine solution is toxic and causes severe skin burns and eye damage and is harmful if inhaled. Therefore, all security instructions described above must be followed closely. 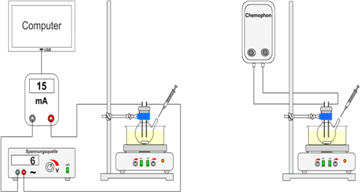 As the focus of this paper is the investigation of the influence of the variation of temperature, this experimental procedure is described in detail. Alternative experiments focusing on the variation of solvent are conducted in the same way. The amounts used are displayed in Table 1. An amount of 5 mL isopropanol is poured into a 10-mL three-necked flask. After the solvent reaches the adjusted temperature, the conductance of isopropanol is checked. Afterwards, tert-butyl bromide is added quickly via a syringe and the change of conductance is observed for three minutes. After five minutes, the gas in the flask is pumped ten times into the bromine solution. Alternatively, after five minutes of running the experiment, the gas in the flask can also be pumped onto a strip of wet indicator paper. The experiments focusing on the variation of solvent (experimental set I) and the variation of leaving group (experimental set II) showed that the use of isopropanol as a solvent and tert-butyl bromide provided the best results for investigating the competing SN1 and E1 reaction. Isopropanol has a higher steric hindrance than ethanol but it supports the dissociation process better than tert-butanol (Figure 9). Furthermore, tert-butyl bromide is easier to handle and store than tert-butyl iodide. Raising the temperature in experimental set III led to a significant increase in conductance values. Isopropanol has a low intrinsic conductance, which means that all following changes must be related to the formation of conducting products. Figure 10 shows the different graphs for temperatures of 60°C, 45°C and room temperature. All three graphs increase after the addition of tert-butyl bromide to the solvent. Still, there are significant differences. Conductance values for the reaction at room temperature increase from 0.1 µS to 4.8 µS, whereas the values at 45°C increase from 0.5 µS to 33.7 µS and at 60°C from 1.7 µS to 95.3 µS. The different values for the intrinsic conductance of isopropanol result from the different temperatures. These findings imply that a reaction in which conducting particles were formed proceeded. 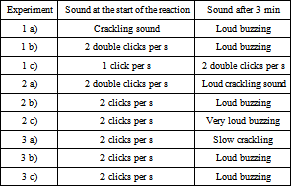 This can also be confirmed when using the “Chemophon.” Table 2 shows the changing sounds that can be recorded. Nevertheless, increases in conductance values do not proof the formation of isobutene directly. Therefore, we added a second set of analytical experiments to identify the presence of alkenes in the gas, concentrating in the flask above the solvent. Pumping this gas ten times into a test tube with bromine water solution five minutes after starting the reaction showed different levels of decolorization of the brown bromine solution (Figure 11). All experiments within a group were designed as contrasting cases. This means that all experiments can, in principle, be conducted individually, but the whole set should be conducted to investigate the effect of the variation of temperature. Consequently, it is important to always vary only one single condition (solvent, leaving group or temperature). The same applies to the analytic used. If only one analytic method, for example, measuring conductance, is used, the hints for an SN1 or E1 mechanism are too weak. The combination of all analytic methods leads to only one possible interpretation. There is a competition between the E1 and SN1 reaction and altering the temperature shows a clear preference for one reaction over the other. 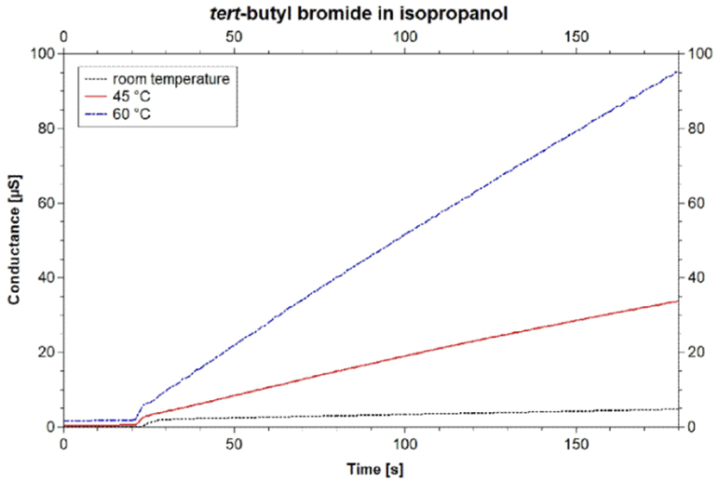 The detection of isobutene with the bromine water solution shows that although isobutene is also being produced at room temperature, higher quantities are formed at 60°C. This is an experimental proof for the connection of the temperature and reaction path. Increasing temperature leads to the formation of more E1 product (isobutene), whereas lower temperatures favor SN1 products. However, the final proof for the subsiding mechanism can only be given by complex analytic methods, such as gas chromatography in combination with mass spectrometry. 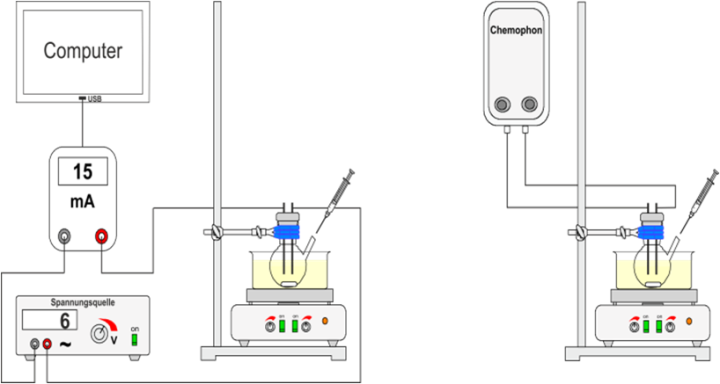 As these are not available at school and too complex for high school students, the experimental sets presented describe experiments that, if conducted in combination, allow only one interpretation for the subsiding reaction. Therefore, they present an excellent basis for a discussion of alternative reaction pathways and the introduction of an extension to the mechanistic thinking by taking the basic concept of energy into consideration. The experiments presented offer a wide variety of possible usage in teaching organic chemistry. They can either be installed in teacher education and advanced training or at high school itself. After teaching the SN1 mechanism, they provide an excellent opportunity to introduce students to a deeper understanding of reactions and the influence of energy. Based on the mechanism of the SN1 reaction known already, students can easily extend their understanding of the basic principles of energy. The competition between the SN1 and E1 reaction is an ideal set to illustrate this connection. This can even be extended to the context of using this instance in the chemical industry, where one product is favored over another in production. Furthermore, the experiments and the accompanying analytic can be conducted by students themselves and provide a good insight into planning and executing experiments with a desired product. They can engage actively in proposing mechanistic pathways and control the experiments themselves by changing the temperature according to the product favored. They can also practice setting up competition experiments, which are carried out under the same conditions and vary only the one parameter which is to be examined. Overall, the wide range of possible executions allows a layout that can be closely modified to the students’ level of understanding. Learning to always connect mechanistic problems with a consideration of energy fosters students’ multivariate problem-solving abilities and trains them in thinking in alternatives, always in connection with previous knowledge. Dealing with the connection of energy and possible mechanistic pathways is transferable to other mechanistic problems. The authors thank the German Federal Ministry of Education and Research (Grant Number 01JA150) for supporting this project within the "Qualitätsoffensive Lehrerbildung". Schmitt, Catharina, Lukas Kaiser, and Michael Schween. "Learning to Think in Mechanistic Alternatives: SN1 vs. E1 and the Gibbs-Helmholtz Equation." World Journal of Chemical Education 7.2 (2019): 102-108. Schmitt, C. , Kaiser, L. , & Schween, M. (2019). Learning to Think in Mechanistic Alternatives: SN1 vs. E1 and the Gibbs-Helmholtz Equation. World Journal of Chemical Education, 7(2), 102-108. Schmitt, Catharina, Lukas Kaiser, and Michael Schween. "Learning to Think in Mechanistic Alternatives: SN1 vs. E1 and the Gibbs-Helmholtz Equation." World Journal of Chemical Education 7, no. 2 (2019): 102-108.